Most everyone with an interest in pre-modern Japanese history (and we're assuming that's anyone reading this) knows of Stephen Turnbull. Describing himself as "one of the world's foremost military historians of the medieval and early modern periods", Turnbull is usually lauded by those new to the field and panned by those with some experience. Relying heavily on Edo period legends and secondary sources, his books make for entertaining reading but usually contain a healthy dose of misconceptions, errors, and editing that would make a fifth grader cringe. He's a polarizing personality on the Samurai Archives Citadel forum. While we've reviewed several of his books favorably, we've still taken him to task for the overall sloppiness and careless nature of some of his books. For several months we've known that Turnbull was writing a book on the 47 Ronin. You all know the story-or at least the popular version where the 47 shining paragons of Bushido led by the stalwart Oishi Kuranosuke slay the evil and corrupt Lord Kira who was responsible for the death of their fair minded, upstanding and exemplary Lord Asano. As we've pointed out many, many times over the years (on both the forum and the Shogun-ki) the legend did not stand up under the glare of critical analysis. Asano was a loutish lecher, Oishi was a drunkard long before being made ronin and neglected his duties in training Asano, and Kira was a typical Edo period bureaucrat. The Ronin were more concerned at first with keeping their positions. After the Asano house was abolished, many possibly hoped to parlay a successful raid into pardons and new jobs. 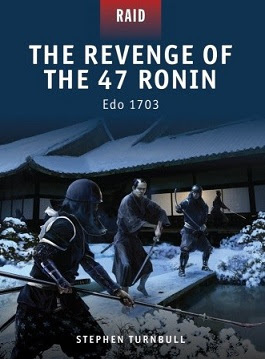 The question was, would "The Revenge of the 47 Ronin-Edo 1703 " follow the newest findings, or would Turnbull stick with the dearly held Edo period legends he had espoused in his earlier books? The first thing we usually do with a new book is to check out its sources and bibliography. While being an Osprey book, it was a foregone conclusion it wouldn't have footnotes or endnotes. But the sources Turnbull used were some of the best, up-to-date scholarly sources on the Ako Incident available. Numbered among them was Beatrice Bodart-Bailey's "The Dog Shogun", "Genroku Ako Jiken", and the landmark series of articles appearing in Monumenta Nipponica by Henry Smith and others that began to question seriously the validity of the Ronin legend. It being a Turnbull book, it was also loaded with a variety of excellent photos, maps, prints, and plates. There are maps showing the likely layout of Kira's mansion (just a typical hatamoto mansion, not a fortified stronghold as often depicted), the route taken by the Ronin after the assault, and spots along the Tokaido road stretching from Edo to Kyoto (and stretching to Ako) that figured in the legend. There's also an excellent chart giving the names of each of the Ronin that specifies what unit they were assigned to during the raid and the weapon they are traditionally associated with. It also gives the 'aliases' that the Ronin were known by in prints and plays that were produced in the aftermath of the assault on Kira's mansion-writers and artists during the Edo period were forbidden to use the names of post-15th century historic personages in their works. "...I (Turnbull) shared fully and largely uncritically in the concepts and images provided by the popular version of the story..."
"...I sat peacefully with a cup of tea while a priest (at Kezo-ji) calmly explained to me how everything I had ever read about the Forty-Seven Ronin was complete nonsense". "...hardly a word of it is true. The date was 1703, not 1702. Their victim's name was Yoshihisa not Yoshinaka. He was no coward. Greed and treachery were not involved and he played almost no part in Asano's death. Not all of Asano's 270 former retainers joined the plot or even sympathized with it. Religion played almost no part in their deliberations. The secrecy involved in their convoluted plot compounded the utter illegality and underhand nature of their act, to which the Shogun responded correctly by invoking the law of the land. The reaction by their contemporaries involved condemnation in addition to admiration, with both the Forty-Seven Ronin and their late lord being dismissed as cowards and a disgrace to the name of samurai. Finally, instead of 47 loyal samurai there were (according to some authorities) actually only 46, or maybe even 48. In fairness to the popular account, however, I can assure the baffled reader that on the night the raid was launched it was indeed snowing". "By 1701 the 60-year-old-Kira Yoshihisa had served successive Shoguns as a loyal and utterly reliable master of court ceremonies for about 40 years. It was a role that required minute precision to detail and the ability to organize with clockwork precision. A man in that position, one can safely assume, did not suffer fools gladly. When faced, therefore, with having to instruct in etiquette a young daimyo to whom court ceremonial was much less interesting than court ladies, and a man who appeared ignorant of the most basic learning and yet enjoyed an income 11 times greater than his stuffy old teacher, Yoshihisa's self-control was to be tested to the limit". (about Asano) "The main means of promotion among his retainers appeared to be their success in obtaining women for him. He was surrounded by flatterers and toadies. These flatterers and toadies included, of course, the future Forty-seven Ronin". "...the population who lived in the gaudy world of Genroku craved a more direct heroism of a bygone age. If Kira Yoshihisa represented anything at all to them, it was the ordered, compassionate, legalistic and very boring world of the Shogun Tsunayoshi, not the exciting world of the sword-wielding samurai. To embrace this world the public had to ignore deceit, deception and a callous massacre, and, by creating a demand for the enduring myth of the Forty-Seven Ronin, ignore it they did". Bravo! For all that, Turnbull keeps his tone as neutral as possible, never vilifying the Ronin needlessly or downplaying their well organized and carried out assault. He's not pursuing any sort of agenda and it makes for a fair and balanced presentation of the facts. We found the section of the book dealing with the '17 Loyal Retainers of Lord Kira' to be the most intriguing (these being the 17 people killed by the Ronin during the raid). Contrary to what many Japanese sources state, it seems that Kira had 14 armed guards in the mansion on the night of the assault (not the 3-5 that are usually given). This changes the perception of the raid quite a bit-rather than a nine to one advantage in numbers, the Ronin instead appear to have enjoyed only a three to one superiority (and also means that they only killed three civilians, not the nine or so they are usually blamed for). Turnbull does an excellent job of backing up his statement, examining Kira's stipend and breaking it down into the composition of the troops the Bakufu would expect him to provide. The final tally matches almost perfectly with the numbers seen at the Kira mansion on the night of the raid. Turnbull also examines the 17 names given on the memorial to Kira's retainers at the former site of his mansion in Matsusaka Park in Tokyo, where it's shown that 14 are samurai. It's excellent work and Turnbull is to be commended for it. The book is rounded out by a short examination of the Ronin in art and literature, a guide to the sites and memorials associated with the raid, and suggestions for further reading. The cottage industry that the Ronin have become (second perhaps only to the 'Bum of Tosa', Sakamoto Ryoma) is borne out in a photo of a souvenir shop loaded to the rafters with 47 Ronin items. There are a few minor issues with the book. For example, Turnbull states that the Ronin committed ritual suicide, whereas (except for one) they were all beheaded BEFORE beginning the act. There are also the typical editing and spelling problems that Turnbull's books are notorious for. I'm sure there will be other minor issues that will crop up when we subject the book to an in-depth reading, but considering its overall excellence and copious new information, these are just small blemishes. However, not all the latest Turnbull/Ronin news is encouraging. It should be noted that according to an interview on the University of Leeds site, Turnbull acted as the historical consultant on the upcoming Keanu Reeves version of the 47 Ronin story being filmed in Hollywood. According to Turnbull, "I've was asked to be historical adviser on a new film that's being made starring Keanu Reeves. The producers wanted it to be as historically and culturally accurate as possible, so they consulted me - which was incredibly exciting!" This 'historically and culturally accurate' film will also be including 'computer generated fantastic creatures'. And the sad thing is, the fantastic creatures will likely be far more historically accurate than the film's portrayal of the 47 Ronin story. And speaking of 'fantastic creatures based on beasts', we decided to put the book to its ultimate test. 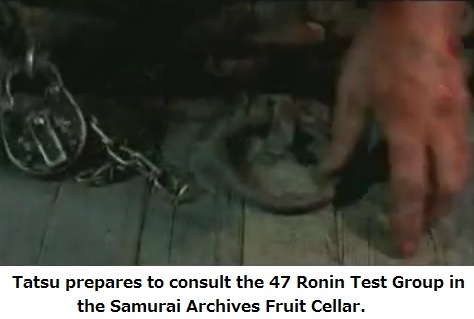 Cracking open the chained door of the Samurai Archives fruit cellar a couple of inches, we tossed down a copy. Down below, we heard the bellow of disbelief from the imprisoned 47 Ronin cultists, followed shortly by the chaos of their death throes. Mission accomplished! In our opinion this is far and away Turnbull's best book to date with the possible exception of "The Kakure Kirishitan of Japan". It immediately becomes the best English language book on the 47 Ronin (it should be noted that the West's preeminent scholar on the Ako Ronin, Henry Smith, has yet to author a book on the subject). Given Turnbull's following in pop culture history, it's no exaggeration that with this single work he may have slain the 47 Ronin-or at least the legend that for far too long has been accepted as fact. While it will take years to fully be relegated to the realm of fiction and fantasy, Turnbull has taken the first steps towards introducing the real story to the world of non-academia. Since it's a revelation that many of his readers might be highly resistant to and might cost him a few of them, it was a bold move. With the steady improvement of his work over the past five years and his increasingly ambitious research ethic, one hopes that THIS is the Stephen Turnbull we continue to see. Be sure to pick up your copy at the Samurai Archives Bookstore, powered by Amazon.com. Bravo i am so glad Dr T or lets call him the good doctor took this standpoint . I was expecting the usual drivel but this is refreshing to hear . Wow. After all that we have come to expect from Dr. Turnbull, that this book should tear down the legends and base itself on some of the latest and best scholarship is a most pleasant surprise. Wow, I am shocked and impressed. Thank you Dr. Turnbull. I am not a big fan of the 47. That being said, if this book is legit, then it might be worth the purchase. Dr T was pretty much the most entertaining and enthusiastic lecturer I had at Leeds - he talked with me briefly about his consultancy on the film during a seminar, and said he'd mostly been used for accuracy of architecture and etiquette. Seeing as how Tom Cruise wearing shoes indoors to meet the emperor in The Last Samurai got him so riled, I'd assume he did all he could to make sure the film was accurate in the areas they asked him about. I think the problem with the movie will be that, just like with that silly geisha movie from a few years back (based on a god awful book, which was basically a male fantasy of submissive women), they will have a consultant who is an authority on the topic, but will then completely ignore him. They do so in the geisha movie, they will do so here. Same with Last Samurai, not only the indoor shoes, but even the languages wasn't period, or even correct. Remember how Koyuki's character addresses Tommy's with "anata" in one scene? That's not period, that wouldn't even happen today between a woman and a stranger. That's Hollywood for you. They're ridiculous these days. Abandoned By The Heavens-"The Clone Returns Home"